Staff at the Brighton Centre must find it strange when people walk out of a show that costs £75 a head. Indeed, it’s hard to explain why, having been given a rare chance to catch one of our favourite singers, we ended up leaving early. It wasn’t Leonard’s fault – it’s just there are only so many Hammond organ solos we can take. Opening with mid-career hit ‘Dance Me To The End Of Love’, the band have a fine full sound, and, set against the red backlit drapes, it makes for an impressive spectacle. Cohen has selected a team of expert musicians for this tour, a nine-piece ensemble comprised of bass, drums, guitar, violin, what looks like a mandolin and a trio of backing singers. Plus a Hammond organ player. Encircled by his band, the singer drops to his knees, head down, seemingly floored by the gravity of his words. For a moment we wonder if the septuagenarian is having problems with his legs. Can he even get up? But we’ve underestimated the spritely old bugger: up he pops with a wry smile. “I don’t know when we’ll be back here again,” he tells us. “But, friends, I promise you tonight, we’ll give you all we’ve got.” The problem is: if less is more, then all is too much. The band are pitch-perfect professionals and their surefooted sound lends itself to big production hits from Cohen’s cheesy era, aka the 80s onwards. Conversely, early classics like ‘Bird On A Wire’ and ‘Lover Lover Lover’ suffer from the full-works treatment. Every vocal line is followed by a linking riff; every pause filled with an instrumental flourish. Likewise, almost every song features one too many solos. Sometimes it works. ‘Who By Fire’ starts with a lengthy improvised introduction from the masterful Javier Mas on what looks like a twelve-string guitar. It’s indulgent but phenomenal. Nevertheless, by the time the interval arrives we are wearying of the familiar routine of verse, chorus, spotlight, solo, applause. Cohen himself seems awed by the musicians he’s hired, rarely missing a chance to introduce them whenever their turn comes. He also introduces the band as a whole, and a few songs later, he does it again. We wonder if the septuagenarian is having problems with his memory. Let’s recap. Leonard Cohen released four flawless albums in the years between 1969 and 1974. Those records have a unique and timeless sensibility: a mix of folk and flamenco guitar with ponderous melodies heavy with reverb. And then there’s the lyrics. Rarely does pop do poetry with any success, but Cohen is one of the exceptions. Every song on those records is packed tight with uncanny imagery, insights and religious allusions. And sombre as they are, Cohen’s odes to love and loneliness are never without hope. There’s often humour in there too. Anyone who claims they’re depressing hasn’t been paying attention. Alas, the sparse arrangements of those recordings have been replaced tonight by a rich tapestry of superb musicianship. Damn them! But to be honest, anyone who’s kept up with Cohen’s back catalogue will know this complaint is 30 years too late. 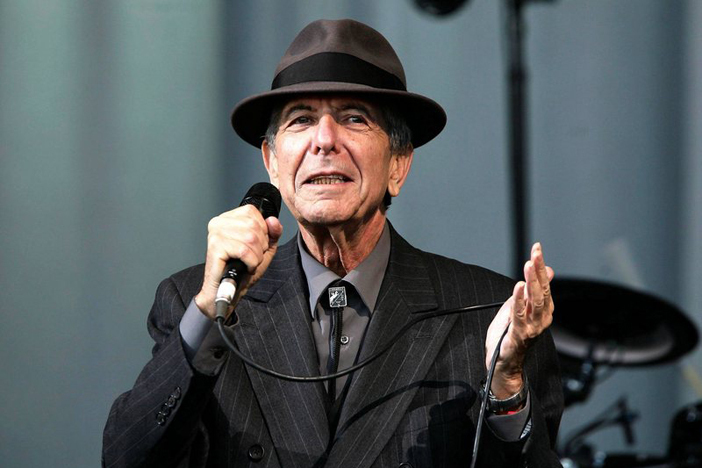 Alongside other luminaries of the 60s like Lou Reed and Bob Dylan, Leonard Cohen suffered from an astonishing lapse of taste in the 1980s (arguably the decade had this effect on most musicians, but that’s a debate for another day). If you really need proof that Leonard lost the plot, go check out the video for ‘Hallelujah’. Seriously. After the interval we’re treated to the comical ‘Tower Of Song’ which sees our hero musing on the plight of musicians while his team of international virtuosos are forced to take a back seat to a basic Casio keyboard demo. Why? We don’t know. Immediately afterwards, Cohen takes up his guitar and modestly picks his way through ‘Suzanne’ and ‘Chelsea Hotel #2’. This, for us, is the highlight of the evening – an all-too-brief reminder of his knack of using simple folk songs to explore the subtleties of heartbreak, existential anguish and whatever else is implied by oranges that come all the way from China. It’s relatively paired-back and the mood is pure melancholic joy. Then it’s back to business as usual with ‘Waiting For The Miracle’ from the forgettable 1992 album, ‘The Future’ (it wasn’t). We get more fidgety Hammond organ solos, more middle-of-the-road blues licks and more synchronised swaying from the backing singers. We make to the second encore (and a second standing ovation) before heading out, stopping on route for ‘Famous Blue Raincoat’ while a punter at the top of the stairs does a passionate but ludicrously inappropriate dance involving repeatedly bending over and punching the air. Then we’re onto the street, dodging the touts who’ve spread their ‘official’ tour T-shirts over the pavement. We later learn that we missed a further encore, yet another band introduction and a third standing ovation. Sorry, Leonard.